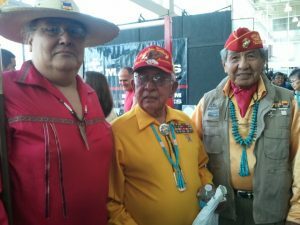 IIA was founded in the late 1980’s in the Dallas Ft. Worth Texas area by Gregory G. Gomez, MSSW, Eddie Sandoval and Cathy Gutierrez-Gomez., PH.D.
Gregory G. Gomez is an Apache, Vietnam Veteran who has a long history of working with and for the Native American Indian community. He has served as a Child Welfare Specialist at the Administration of Children and Families for the US Department of Health and Human Services, provided cultural guidance and consultation for various organizations and currently serves as President of the Indigenous Institute of the Americas .Eddie Sandoval, -also Apache, grew up in west Texas where he was known for his athleticism in all sports.. He received a scholarship for college in track & field. and attended several universities including North Texas University and Texas Tech in Austin . 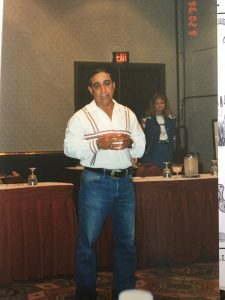 Many people who know Mr. Sandoval in the academic world as a former Professor in Tarrant County, do not realize he has been on cattle ranches his whole life and is an avid horseman. Mr. Sandoval spends his time with the love of his life, his horses and has continued his advocacy on issues related to the Native community. Just the past December 2017, Mr. Sandoval was asked to assist in the ceremonial repatriation and re internment of a 1,100 year old Native woman’s remains, and this was not the first time as Mr. Sandoval is one of the 1st American Indian asked to assist in the repatriation and re internment of artifacts and the remains of our people. As a spiritual leader in our community, Mr. Sandoval worked extensively with the US Department of Justice to ensure Indian men were allowed access to a sweat lodge and sacred amulets for sacred spiritual ceremonies Mr. Sandoval is now a retired after teaching almost 30 years as a Professor of Psychology and Engineering a Tarrant Co. Jr. College. .Mr. Gomez and Mr. Sandoval, both Sun Dancers, worked together for many years to maintain a sweat lodge in Burleson, TX. 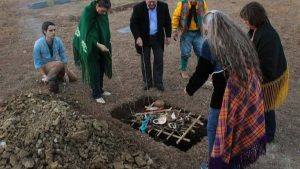 Starting in the 1990’s and for many years after, they were blessed to work with a traditional healer from Rosebud reservation who was influential in helping many Native people in Texas find their spiritual path in the right way. Gregory Gomez at Gourd Dance to honor the Navajo Code Talker from WWII. 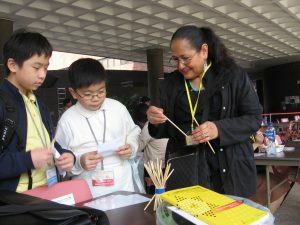 Dr. Cathy Gutierrez-Gomez working with students.